Xander raised up on one elbow and regarded the figure in bed beside him. Spike was dead to the world. Spike was dead, period, but he was also sleeping soundly, peacefully and apparently dreamlessly. 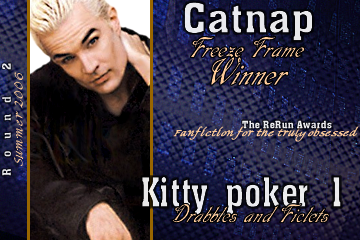 Spike’s brow furrowed and Xander wanted to kiss every tiny line. Spike smiled. His honey was a daft one, but lovable. He wound himself around Xander and went back to his untroubled sleep.